Birmingham was honored to have a front row seat at Pope Francis’ inauguration ceremony with Bhai Sahib Mohinder Singh, Chairman of Guru Nanak Nishkam Sewak Jatha (GNNSJ) and Nishkam Civic Association witnessing the grand ceremony. Tens of thousands turned out in St Peter’s Square to create a sea of flags and banners for the new Pontiff’s inauguration mass and the ceremony saw faith leaders from all denominations present to witness and celebrate the historic occasion. This included Handsworth’s very own, Bhai Sahib Mohinder Singh, who has had long standing relations with the Catholic Church in promoting peace for people of all faiths and none. Pope Francis received the symbols of the Papacy and in a homily delivered entirely in Italian, the 76-year-old Pontiff invoked Francis of Assisi, urging pilgrims and rulers alike to protect ‘each of God’s creatures’ and to respect the environment they live in. The message resonated with millions of people worldwide who witnessed the event. Reflecting on the Pope’s message, Bhai Sahib Ji said: “It was a moving message that recognised the importance of all humanity. All religious traditions and faiths are based on the foundations of compassion, mercy and forgiveness. When you talk about ‘justice’, it must be within the context of practising compassion, mercy and forgiveness; you cannot let go of these virtues and values for a second, otherwise the structure (religion) will collapse – we welcome Pope Francis’ inspiring speech. 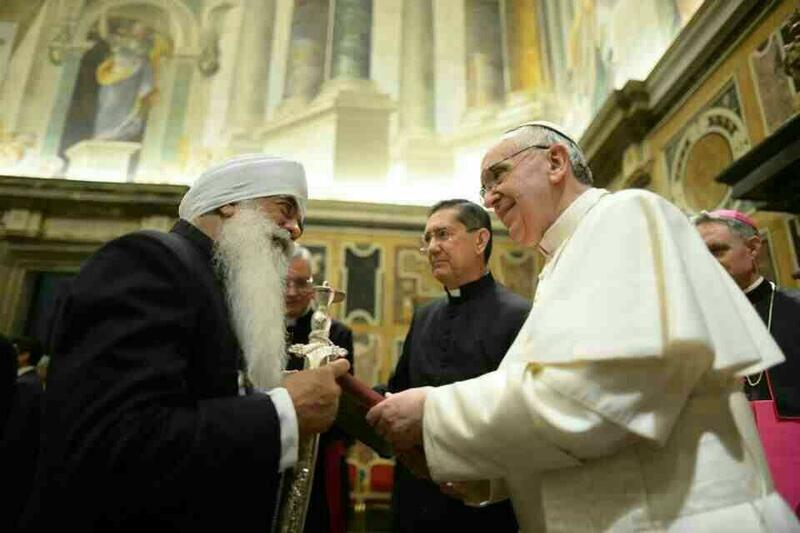 Bhai Sahib is no stranger to seeing the Pope; his first audience with the Pontiff was during the Christian ‘Year of Jubilation’ in May 2000, where he met with His Holiness, Late Pope John II and presented him with a Sri Sahib (Sword of Peace). In March 2002, a ‘Day for Prayer’ was held in Assisi, Italy, where Bhai Sahib attended a religious gathering at the invite of the Pope. In April 2002, Bhai Sahib was privileged to pay his respects at the funeral of His Holiness, Pope John II, who had contributed immensely to building bridges of friendship across religious boundaries and promote peace in the world. September 2006 saw Bhai Sahib’s first audience with His Holiness, Pope Benedict XVI in Basilica. This second Sikh-Catholic dialogue renewed the warm and open relationships between the Sikhs in Birmingham and the Catholic Church and set up a permanent structure for engagement between Sikhs worldwide and the Holy See. Many events continued to follow which further strengthened the bond that has grown as a shining example of interfaith dialogue. Bhai Sahib, an internationally renowned ambassador for faith and service, was created a Knight last year by the Holy Father Pope Benedict XVI, in recognition of his dedicated work for Roman Catholic-Sikh relations and undeterred commitment to working for peace among people of all faiths. Bhai Sahib added: “More than being ‘fairness-orientated’, we must be ‘action orientated’. Guru Nanak Dev Ji [the First Guru of the Sikhs] insisted that ‘truth is high, but higher still is truthful living’. Such a life begins through transforming our consciousness and internal chemistry, to become instruments of change, initiating change in our immediate surroundings and contexts whilst working to serve the wider wellbeing of all. The Pope can be a great positive force for change by addressing social justice to bring about peace in the world around us. 1. Guru Nanak Nishkam Sewak Jatha (GNNSJ) is a multi-faceted, faith based organisation practising and propagating the Sikh Dharam (faith) in the name of Guru Nanak Dev Ji (1469-1539). It has been involved in selfless intra-faith work in Kenya and India informally since 1950, and formally in the UK since 1978 as a registered Charity through five centres for excellence in the inner-city depressed area of Handsworth, Birmingham, where its Headquarters are based. GNNSJ also has sister organisations in Leeds and London (UK); as well as in Kericho (Kenya) and Amritsar (India). Significant achievements have been made by GNNSJ in the conservation and restoration of historical Sikh shrines. Chaired by Bhai Sahib (Dr) Mohinder Singh z aims to serve and uplift society through the practice of core values – nishkamta, or the spirit of selflessness, being one of them. Inspired by spirituality, GNNSJ has generated a flourishing culture of volunteering, which has contributed immensely to transform visionary projects into reality. For his services to religious faith propagation, community service, education and research, Bhai Sahib has been awarded two Honorary Doctorates from Birmingham’s Universities. He is passionate about values-based education and is the Patron of the Nishkam Education Trust. · Trustee of Anandpur Sahib Foundation. · Chairman, since 2002, of the British Sikh Consultative Forum (BSCF) representing some 80 Gurudwaras and Sikh Organisations in the UK, striving for intra-faith and interfaith community cohesion and engagement with the UK Government’s Department for Communities and Local Government (DCLG). · Chairman of Sangat Trust. · International Trustee of Religions for Peace the largest international coalition of representatives from the world’s religions dedicated to promoting peace in more than 70 countries. · Member of the Elijah Board of World’s Religious Leaders (EBRL). Hosted conference in 2007 in Amritsar, India. · Member of the European Council of Religious Leaders (ECRL). Hosted conference in 2007 at Nishkam Centre. · Member of Fetzer Institute’s Advisory Council on World Religious and Spiritualties. · Member of Tony Blair Faith Foundation’s Religious Advisory Council. · Executive Member of Religions for Peace (UK). · Supporter of United Religions Initiative (UK). · Trustee and Chair of the Museum of World Religions (MWR (UK)) working group. · Supporter of the Council for Parliament of the World’s Religions (CPWR), Chicago, USA. · Supporter of Globalisation for the Common Good, promoting an ethical, moral and spiritual vision of globalisation. Hosted conference in 2005 in Kericho, Kenya. · Supporter of the Goldin Institute, working towards building grassroots partnerships for global change. Hosted conference in 2005 in Amritsar, India. · Member of Department for International Development (DfID) Faith Working Group. · Supporter of Jubilee Debt Campaign since its inception. · Participant in Shared Act of Reflection and Commitment by the faith communities of the UK, 2000 and participant in World Peace Prayer, Assisi, 2002 upon the invitation of His Holiness the late John Paul II. · Patron of Divine Onkar Mission, UK, a charity reaching out to people in some of the most remote parts of India. · Trustee of Birmingham Citizens, a social action organisation. · Patron of Sikh Mental Health and Wellbeing Trust. · Executive member of West Midlands Faith Forum. · Member of Birmingham Faith Leaders Group since its inception in 2002.